How often do you clean your caravan? For this Spring, we’ve updated our caravan cleaning guide so we thought we’d find out how many times you get out the ladders, brushes and cloths to get your caravan spick and span for lots of touring trips. 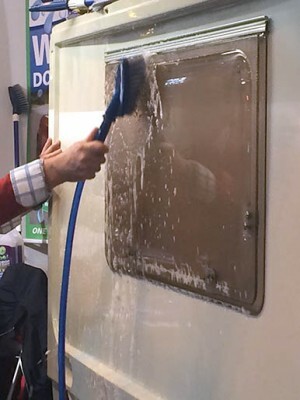 Our latest poll question is, how often do you clean your caravan? The amount of elbow grease and shampoo needed will probably depend on how well protected your caravan is whilst in storage or how often you’re towing it on the road. Cast your vote, by simply checking the nearest answer or select “other” and put your comments in the box below. And don’t forget if you want to make any comments about how often you think a touring caravan should be cleaned then leave a reply below. We love to hear your thoughts! ditto to all the comments so far, have some pride. I like this one some has been watching me !! Every time when we go out with van it gets cleaned when we get back home inside and out and polished at least twice a year. I also hate a dirty caravan. I clean my motorhome every week, weather permitting. But certainly before and after every trip !! Keeps it looking good and presentable !! Every time we use it I thoroughly clean it before it’s closed up. All sick and span for our next outing! I wash mine if it has been out in particularly bad weather, otherwise probably between 1 or 2 months. Polishing I do at the beginning of the season and just before winter sets in, I may also spray with a silicone spray. I had my caravan treated with Diamond polish from new. This makes it much easier to clean and get rid of those black streaks. The caravan will be thoroughly cleaned inside and out after its annual service in March and again just before we go away – that’s another 6 or 7 times a year. Also, if we have had a dirty journey en route we will wash down the exterior on site. I clean the Windows with a glass cleaner sprayed on and gently polished with a microfibre cloth. How often? When I can’t find the door. I’m with John Allerton, as and when but very seldom. Two reasons. The owner of the store where we keep it always hoses it down on arrival to establish any damage for which he does not wish be blamed. And secondly, we had it gardex treated when we bought it and it seems to very satisfactorily reject dirt which washes off with the rain. I clean the caravan as and when required,but hate cleaning the windows lol ! We clean our van everytime it is used “which is a lot” . We give it an all over externall polish before the winter. And wash and wipe over with showroom shine when away so as to keep the streaks of dirt off the paintwork. Every time we use the van and when it gets dirty even if we haven’t used it. I clean the caravan normally before leaving for a trip, and then on return. The roof of the caravan I normally clean at least once a year. We give our 1999 Abbey a deep clean and exterior wax before and after winter storage. After each trip, we do a full interior clean. Before each trip out, we do an external wash and an interior freshen-up clean. I clean my caravan after every trip out. We do 5 long trips a year, so that’s 5 full cleans, but I clean off any heavy dirt whenever I feel it needs it. I always clean the exterior and interior thoroughly before closing up for the winter and treat the outside surfaces to some Autoglym super resin polish. Before first use I thoroughly clean the exterior with Autoglym shampoo and conditioner to remove the build up of deposits and streaks left by the winter weather. The caravan then gets a wash and clean out after each use during the season, that’s at least six times, with another polish with the super resin polish again during mid season. Gets washed outside before each outing & inside before & after each outing. I tend to clean mine whenever I notice any little marks or stains, I hate a dirty caravan and its always given a wipe over before I go away.